Let your imagination run wild with you as the sky is the limit when it comes to installing glass splashbacks! There are numerous colours and textures available, you can even have your own favorite picture incorporated in it! Each and every installation is tailor made for you. The glass can be installed where ever you like – you can have a small feature of glass behind the hob for example, or the entire length of your kitchen! (the maximum length is 3 metres without any joints). The coloured glass also looks fantastic in bathrooms, ultility rooms – it can be installed anywhere! 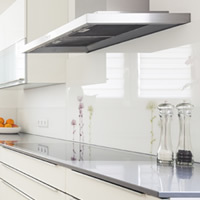 Our high quality, coloured glass splashbacks are produced in 4mm or 6mm low-iron glass as standard (other thicknesses are available upon request). The low iron glass makes the colours clearer to see than normal float glass. Durable, heat resistant, long lasting and very easy to clean,! There are no grout lines, so bacteria cannot grow and there is nothing to discolour! The glass is spray painted to your choice of colour (or picture), and you can choose from a wide range of brands – Dulux, Crown, Farrow and Ball, RAL and Pantone. If you can’t see what you want, just let us know and we will match it for you! For the added wow factor, why not incorporate down-lighters – this really does enhance the glass and brings the colour fully to life!